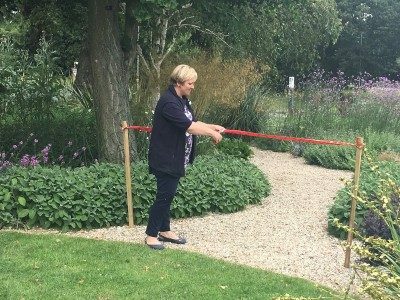 Horticultural students and staff of Writtle University College have created a new dry garden at the entrance to the main campus, and Perrywood’s Communications Manager Rachel Keeble went along to the grand opening…. I am a huge advocate of Writtle College University and it’s inspiring teachers who genuinely care about the achievements of their students. 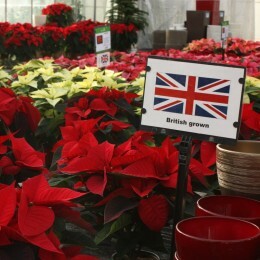 If you’re looking to study horticulture then Writtle is your place! 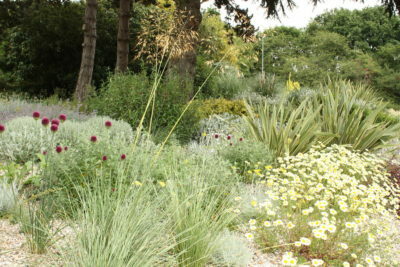 During my time there, while studying for the RHS Level 2 Diploma, I was lucky enough to work on the development of a new Mediterranean dry garden at the front of the main college entrance. The area, which sits underneath a number of large pines, conifers and birch trees, had previously become overgrown with wayward shrubbery and depleted of soil moisture. The three year project to transform the area, involved a number of horticultural students from the college, all taking an active part in either clearing the existing area, cultivating the soil, laying the paths, planting, or maintenance. 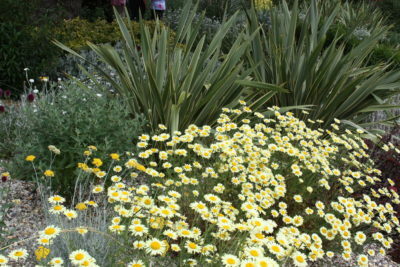 The result is a beautiful Mediterranean inspired garden that creates maximum impression for students and visitors arriving at the campus, and demonstrates how, even when faced with a tricky dry, and in some areas shady site, by selecting appropriate plants for the soil conditions and environment, it is possible to create a stunning display that will tolerate minimal watering during the summer months when the college is closed. 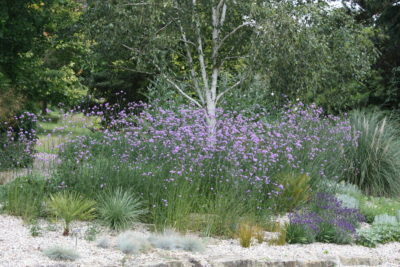 Along with my fellow alumni, current students and staff, I was recently invited to the official opening of the garden by Julia Boulton, Managing Director at Beth Chatto Gardens – whose dry garden is renowned for its spectacular display of drought-tolerant plants. 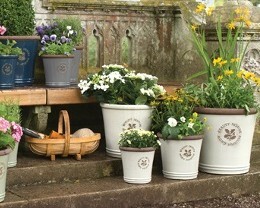 Julia also happens to be Beth Chatto’s granddaughter! 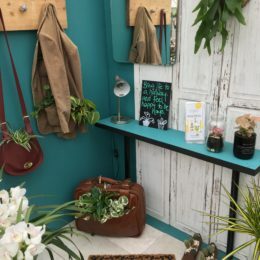 The garden was designed by RHS tutor Christine Lavelle whose design was inspired by the gravel gardens at Beth Chatto and RHS Hyde Hall, as well as the winter garden of Cambridge Botanical Gardens. 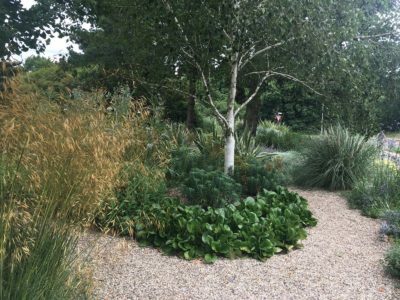 The borders can be enjoyed from the gravel pathway which meanders through the garden and round the existing trees, providing intrigue to turn corners and explore further. 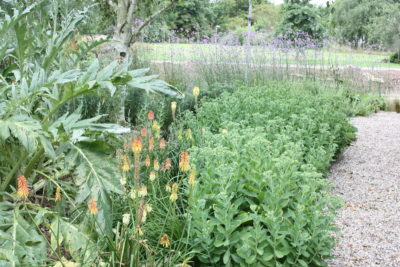 The plant selection includes swathes of pollinator loving Verbena bonariensis (Argentinian vervain) which provide a dazzling display, and the eye-catching Kniphofia rooperi (Rooper’s Red-Hot Poker) and Cynara cardunculus (Cardoon). 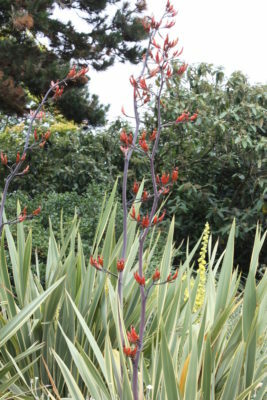 Phormiums give a bold maturity at the end of the borders and are brilliant in strong winds in a more open position. 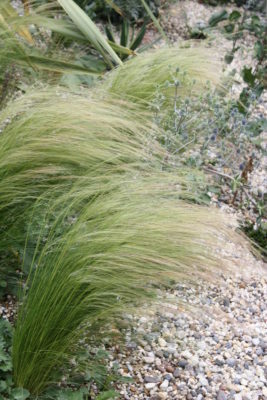 Ornamental grasses are a plenty in the garden due to their tolerance of dry conditions. 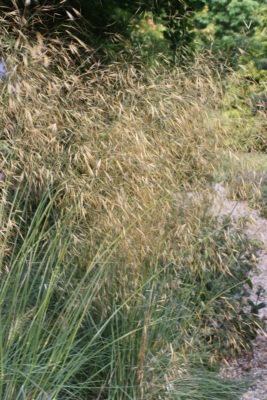 Calamagrostis, Stipa gigantea, Stipa tenuissima, Carex testacea and Ampelodesmos mauritanicus provide texture and movement throughout the garden, with the later being an excellent performer underneath the towering cedar tree. 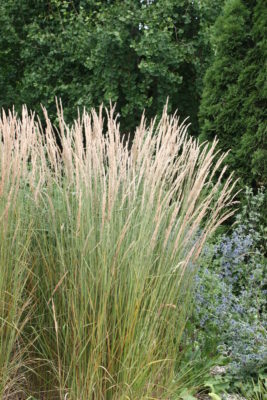 The classic Cortaderia selloana ‘Pumila’ (Pampas grass) creates a dramatic focal point. 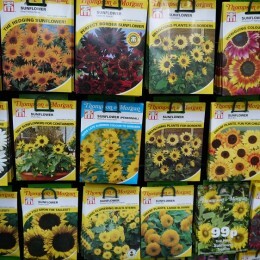 From September, when the students return from the holidays, it was important that the garden continued to provide interest through autumn and the long winter months. Inspired by the winter garden at Cambridge Botanical Gardens, the existing white stemmed Betula utilis var. 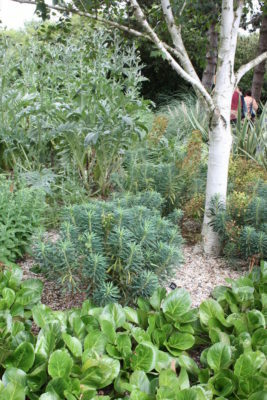 jacquemontii (West Himalayan birch) is beautifully contrasted with the maroon tones of Bergenia ‘Bressingham Ruby’ (Elephant’s ears) and the vivid lime greens of Euphorbia characias subsp. 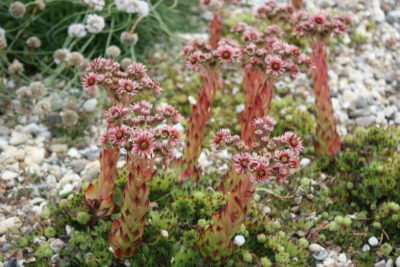 wulfenii. 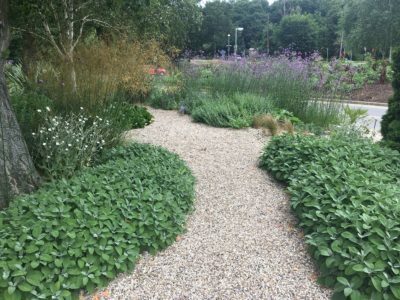 The Mediterranean Garden is the latest addition to the themed landscaped gardens on the Writtle campus, which include the Hot and Spicy Garden, the Rose Garden and the Centenary Garden.